On June 13 at approximately 7:20 p.m. the Calcasieu Parish Sheriff’s Office received a call in reference to a woman causing a disturbance at a local park in Lake Charles. Upon arrival deputies met with a witness who stated the women, later identified as Sarah D. Breaux, 26, 1049 Lake Land Street, Lake Charles, was cursing in front of the other children at the park. The witness also stated Breaux appeared intoxicated and had fallen in the parking lot while holding a baby. Deputies located Breaux, who was irate and hollering. When deputies spoke with her they detected an odor of alcohol emitting from her breath. Deputies also observed Breaux to have an unsteady balance, swaying side to side. Deputies asked Breaux to retrieve her ID, at which time they walked to her car and when she opened the door deputies detected a strong odor of marijuana coming from inside the car. 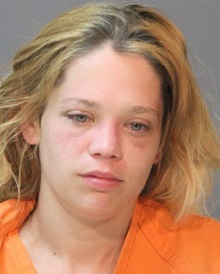 Deputies also witnessed Breaux attempt to conceal drug paraphernalia while getting her ID from inside the car. A search of the car revealed two partially smoked hand rolled cigarettes containing marijuana as well as several items of drug paraphernalia. Breaux performed poorly on the standard field sobriety test. Breaux was arrested and transferred to the Calcasieu Parish Sheriff’s Office, where a breath intoxilizer test revealed she was over the legal limit. While deputies were speaking with Breaux she stated that she had been drinking. She also stated she smokes marijuana regularly in the presence of her 10 month old child who was with her at the park. The baby was released to the custody of a family member and transported to a local hospital due to witnesses observing Breaux breastfeeding the baby prior to deputies’ arrival at the park. Breaux was booked into the Calcasieu Correctional Center and charged with possession of marijuana 1st offense; possession of drug paraphernalia; illegal use of CDS in the presence of person under the age of 17; cruelty to a juvenile; and disturbing the peace drunk. Judge Guy Bradberry set her bond at $10,500. CPSO Deputies Sr. Cpl. Travis Mier, Cpl. Matthew Saxby, and Sr. Cpl. Adam Wentzel are the arresting deputies on this case.